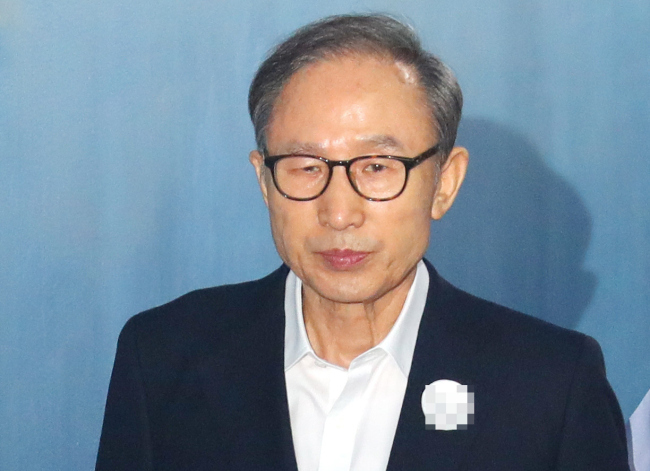 Jailed former President Lee Myung-bak has filed a lawsuit against a major broadcast network and its chief over a recently aired investigative report on Lee's alleged offshore account and suspicious transactions, one of the program hosts said in a social media post on Monday. The lawsuit, seeking 350 million won ($309,270) in damages, was lodged with the Seoul Central District Court against MBC President Choi Seung-ho and two other journalists. The suit also demands the public broadcaster issue a correction of the news report and delete the show from all online platforms, the Facebook posting said. Lee, president from 2008-2013, is currently serving a 15-year prison term after he was convicted of multiple corruption charges pending an appeal. The news report aired on the Nov. 25 broadcast of "Straight,"
MBC's current affairs program. The program raised suspicion that Lee may have tried to send a large sum of money in dollars to a secret overseas account. The accusation was based on statements from an unidentified person who claims to have been mistakenly contacted by a financial firm to confirm the remittance, because the person had the exact same name as a Lee's aide, the actual recipient of the money. A spokesperson from MBC said the show was based on thorough reporting and fact-checking, adding that the company will follow all legal procedures regarding the suit. Choi is known for a history of confrontation with the conservative Lee Myung-bak government. He was the chief producer of a MBC news program that was highly critical of Lee's key policies.